Kilmarnock manager Lee Clark has confirmed that captain Mark Connelly is out for the rest of the season following a hip operation. Left-back Steven Smith will have a scan next week on a hip problem that is affecting his groin. It leaves the new manager without three defenders for Saturday's Scottish Premiership visit by Dundee. Darryl Westlake also remains out with an ankle problem, having been on the sidelines since September. Connolly underwent surgery after spending a long period playing through pain. The 24-year-old defender, who has been troubled by the problem since the summer, had said on Twitter: "Time to get sorted! Been a long eight months trying to play with this injury. Today's the day I get back to myself." Connolly has only made 10 appearances for Killie during this campaign. This time last year, Connolly broke his collarbone against Inverness Caledonian Thistle and was out for three months. He returned for the last few games of last season, despite not being fully recovered, to help Killie remain in the top flight. Connolly then suffered the hip injury in pre-season training and could have undergone surgery then. However, that would have sidelined him for another three months, and, having just been given the captaincy, he decided to soldier on. On 22 August against Ross County, he suffered knee and ankle injuries, which sidelined him for 12 weeks. 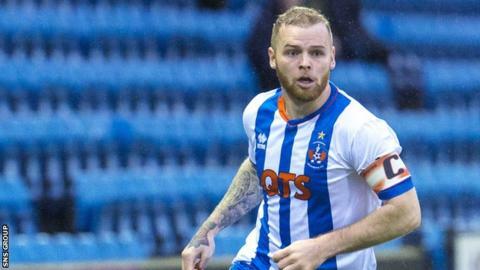 On his return, Killie managed a 0-0 draw against Celtic in Glasgow in November, but Connolly has only played in four games since, making his last outing in December. Now he hopes the Ayrshire side can secure their top-flight status without him, so that after rehabilitation he returns fully fit for the next campaign.